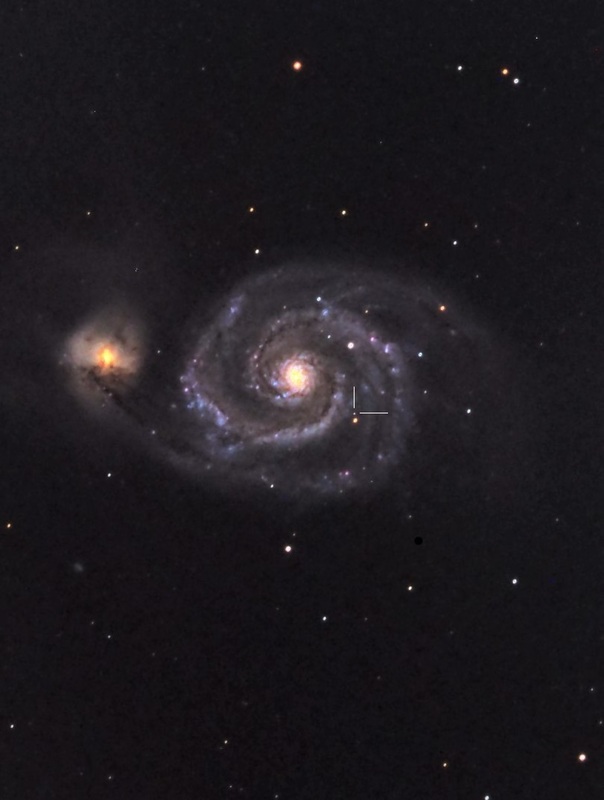 We tried out our new esprit150 refractor on M51 on Saturday evening. We had a few issues but when we processed the image we spotted something that does not appear on internet "stock" pictures. Did you take more than one image ? Update....I am travelling up to Thirsk tomorrow evening and will take a look at all the images we took. Will post update. I did a quick search of the Transient Name Server and there appears to be no reported events events since the 1st March within 5 degrees of M51. Here are the search criteria I used. 50 x 10s frames, median stack, midpoint of imaging run: 20:40 GMT. Unfortunately no bright signal at the same position. Perhaps the transient was in only 1 frame? Does the colour brightness differ in the 3 filters (out of interest)? Yes, of course it could indeed be real. I just posted my image up in case it turned out to be a longer-lived phenomenon. Point meteor may be a good candidate. Transparency last night was excellent.